MÜNSTER -Sumatra ein grosse insel..
MÜNSTER,S. - Sumatra ein grosse insel..
Sumatra ein grosse insel.. - MÜNSTER,S. 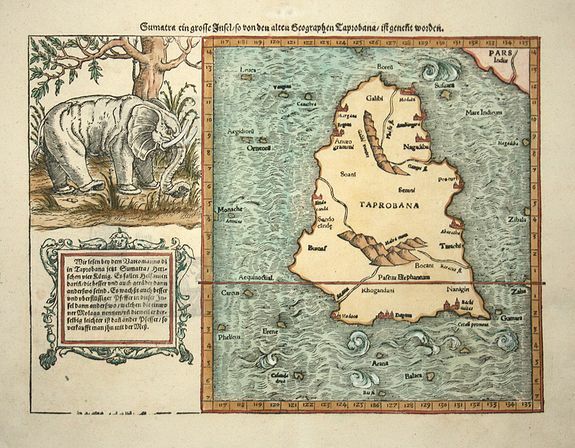 Description :Map of island of Taprobana, which was variously thought to be Ceylon or Sumatra. This map depicts Ceylon with the typical misconceptions of Ptolemy showing a small part of India incorrectly in the northeast corner of the map. The most interesting feature of the map is the large engraving of an elephant beneath a tree that was copied from Gastaldi. The elephant is shown with large padded feet and a scoop on the end of its trunk.